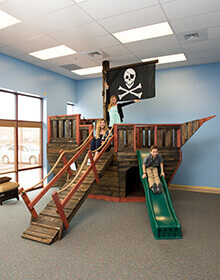 A visit to our dental clinic, and parents and kids alike will immediately notice the large pirate ship playhouse. You’ll be welcomed instantly with our warm and friendly environment, and will greeted by a friendly smile at the reception desk. Following the proper check-in process, a kindhearted assistant will introduce themselves and give your family a tour of the entire dental clinic, including the fun decor in the treatment area with TVs above operatories. Radiographs will be taken and your child receives a prophylaxis. After the exam by one of our friendly pediatric dentists, we have a consultation with you regarding your child’s dental health. Our dentists will provide feedback on oral hygiene, the status of their child’s changing dentition, and any treatment that might be necessary. We believe each child is unique and special, which is why our pediatric dentists work with your family to create a treatment plan that’s customized to meet the specific needs of every child. Finally, you’ll schedule an appointment with our dental clinic before you go—but not without a struggle to get the kids to leave. With our pirate ship playhouse and an extraordinary dental experience from start to finish, it’s no wonder families love coming back to Treasured Teeth time and again.